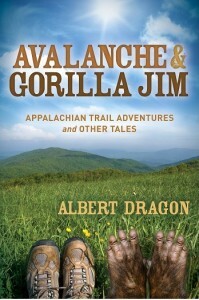 Avalanche and Gorilla Jim: Appalachian Trail Adventures and Other Tales is a true picture of what it’s like to hike over 1300 miles of fun-filled, gut-wrenching, awe inspiring trail. It is filled with the humor of two guys on a long trek over grueling terrain. You actually live and feel Appalachian trail life, its exciting adventures and fun . . . and, in a sometimes crappy world, meet people who enrich your faith in humanity. This is the Appalachian Trail with all its beauty and flaws, written in a style of fresh sharp adventure with a pleasing edge. This humorously different adventure makes you laugh, feel good, gives you some thrills and allows you to actually experience hiking the famous Appalachian Trail. The days are enlivened by lighthearted moments, jokes and bantering. Belly laugh at: getting locked in an outhouse when the door knob falls apart; goofily telling a rattlesnake to hold still while taking its photo; a pet tarantula named Rosie; older middle-aged Avalanche’s quest for younger legs and lungs. But Al Dragon startles us with fascinating accounts of hikers killed, bodies found in and near an A.T. shelter. Others, severely shot, struggle away from their backwoods tormentor. At the Atlanta, Georgia Olympic Games a killer mutilates people with a bomb—escapes to the Appalachian Trail and its surroundings where he lurks while Avalanche and Gorilla Jim hike nearby. You accompany and intimately know the two main characters you’re hiking with. Learn how they got their trail names Avalanche and the memorable Gorilla Jim. Feel the life-changing trail with all senses: blasting heat’s debilitating confusion when you’re out of water, the freezing effects of hypothermia, and the warm pleasures of meeting interesting characters along the way–and people who restore your faith in humanity. Climb mountains, walk within hailing distance of bears, stay in a tent with jagged lightning bolts crashing all around–you’re on the adventure of a lifetime. At any age, this true story inspires you to do more than you ever thought you could.